No president has had a first 100 days like Donald Trump. He won confirmation of a new Supreme Court nominee and ordered the bombing of a Syrian air base. He moved to cancel policies by former President Barack Obama and promised to stop North Korea’s expanding nuclear program. But he received almost as much attention for his tweets. He often uses Twitter to criticize the news media and his political opponents, sometimes unfairly, according to fact checkers. Mark Peterson is chair of the Department of Public Policy at the University of California at Los Angeles (UCLA). Joshua Stockley, a political science professor at the University of Louisiana at Monroe, said the start of the Trump presidency has been frantic. By frantic, he means wild and hurried activity. 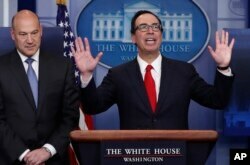 Treasury Secretary Steven Mnuchin, right, joined by National Economic Director Gary Cohn, discusses Trump's tax proposal in the White House in Washington, Wednesday, April 26, 2017. Among the most frantic were the five days leading to Saturday, the 100th day of his presidency. That same day he invited the entire United States Senate to a briefing on North Korea. Senators were told Trump plans to pressure North Korea to pull back on its nuclear weapons program and that war is a last resort. Trump also continued to issue executive orders. By Saturday, the White House said the total should reach 30, the largest number in a president’s first 100 days since President Franklin Roosevelt in 1933. But three executive orders related to immigration have been blocked by federal judges. Two were orders to temporarily block travel from some Muslim majority nations. Another would cut federal funding to local governments that fail to enforce immigration laws. The court decisions were not Trump’s only setbacks. During the campaign, Trump, a Republican, promised to repeal and replace Obama’s health care bill, known as Obamacare. But a congressional vote on a repeal bill was cancelled because there were not enough votes to pass it. A newly negotiated health care plan could get a vote soon, but approval remains uncertain. 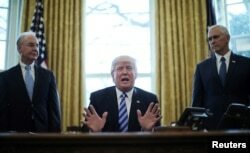 President Trump reacts to the pulling of the American Health Care Act by congressional Republicans before a vote as he appears with Secretary of Health and Human Services Tom Price (left) and Vice President Mike Pence (right) in the Oval Office. Adding to Trump’s problems are FBI and congressional investigations into whether members of Trump’s presidential campaign worked with Russia to influence the 2016 election. Sean Spicer is Trump’s chief spokesman. He said that Trump has been carrying out his promises, particularly on reducing illegal immigration. “I think we feel very proud of what we've been able to accomplish and fulfill the promises that he’s made to the American people,” Spicer said. Sometimes Trump’s policy announcements get less attention than his tweets, often written in the early morning hours. That was the case with four Trump tweets on March 4 that charged Obama with wiretapping his phones at Trump Tower during the election. Members of Congress and the U.S. FBI director said Obama did not wiretap Trump. A Washington Post/ABC News poll this week found that only two percent of people who voted for Trump regret doing so. But with Democrats and many independents expressing negative views, Trump’s approval rate averages 42 percent, according to Real Clear Politics. That compares to an average approval rate of 69 percent for the last 12 presidents nearing 100 days into their presidencies. Peterson, the UCLA political expert, said the good news for Trump is that people who voted for him still support him. Many who voted against Trump are over their shock of his surprise victory, but remain fearful of what Trump will do as president, he said. Susan Roberts is a political science professor at Davidson College in North Carolina. She said many cannot get used to Trump after eight years of President Obama. Obama was often described as “no drama Obama.” By “no drama,” people meant that Obama generally appeared calm. Tony Perkins is president of the Family Research Council, a Christian conservative group. Perkins said a major reason Trump voters continue to back him is his choice of conservative judge Neil Gorsuch for the Supreme Court. “This is why so many people went out to vote for Donald Trump, getting a conservative Supreme Court justice and hopefully more,” Perkins said. President Donald Trump watches as Supreme Court Justice Anthony Kennedy administers the judicial oath to Judge Neil Gorsuch during a re-enactment in the Rose Garden of the White House White House in Washington, April 10, 2017. People who watch American cable news or late-night comedy programs are used to seeing lots of Donald Trump. On Comedy Central this week, “Daily Show” host Trevor Noah discussed the first three+ months of the Trump presidency. “It’s 100 days in Trump time. For us, it’s 15 years,” Noah said. ​In an interview this week with Reuters, Trump said his first 100 days as president were difficult. "I loved my previous life, I loved my previous life. I had so many things going. I actually...this is more work than in my previous life. I thought it would be easier."